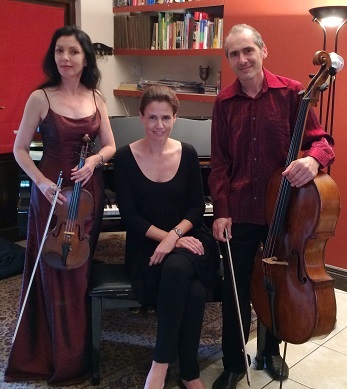 The Friends of Music concert on September 19 at the Jewish Club featured a programme by The Siberian Trio playing Gypsy Trio by Haydn, Arensky Trio in D minor, and Schubert.s Trio in E flat Major. Ensemble playing of the calibre presented at this concert requires rigorous and lengthy preparation. Technical precision and common agreement on the interpretation of the musical textures and “conversations” in the scores, and meticulous attention to balance, which may vary from one work to the next, are the necessary ingredients for a consummate musical interpretation. The performers, Liezl-Maret Jacobs (piano), Elena Kerimova (violin) and Boris Kerimov (cello) succeeded, with both technical brilliance and wonderful musical sensitivity, in portraying convincingly the distinctive and differing stylistic elements of the three works, so well described in the excellent programme notes. The classical Haydn in which the piano dominates, the intensely romantic sweeping melodies in the Arensky that favour the strings enabling them to match the virtuoso piano writing, and the beautiful song-like melodies with the three instruments in perfect balance in the Schubert, this extensive composition forming a fine climax at the end, all made captivating listening. Here one must mention Liezl-Maret’s outstanding command of the difficult piano scores, and, if on a few occasions Elena Kerimova’s tone could have been a little fuller to match her husband’s resonant cello sound, this never detracted from her intensely musical sensitivity.